Is it finally time for a downtown truck tunnel? The province of Ontario is already kicking in $1B for the LRT in Ottawa, so money won’t be easy to find. But we have to find a solution soon because our health—and lives—are at stake. Clearly, something must be done about truck traffic in Ottawa’s core. While we understand the need for trucks to get from Gatineau to the Queensway, one only needs to stand at the corner of King Edward Avenue and Rideau Street for a few minutes to see the problem. Even veteran truck drivers shudder at the thought of negotiating that section of their route. Currently, 26,000 trucks travel daily through Lowertown and Sandy Hill streets—and that number increases by up to 3 percent per year. In 10 years, that will be almost 35,000 trucks per day. From a local-business perspective, making this area more pedestrian friendly will also result in a better retail environment along Rideau Street, something that has long been a struggle for both the city and the merchants. While most would like to see fewer trucks downtown, that is not likely to happen anytime soon. Two years ago, after much debate (to put it nicely) about where the bridge would go and what impact that traffic would have on area neighbourhoods, the province simply pulled the plug. Now, as cities such as Phoenix and Miami have already done and Seattle is in the middle of doing, Ottawa is considering a truck tunnel. A $750,000 feasibility study is underway and, if that pans out, will be followed by an environmental study and, we are told, “extensive public consultation.” The cost is being shared by the City of Ottawa and the province of Ontario. With the province already committing over $1B to the LRT project—clearly, its #1 priority—getting more money for a truck tunnel will be a tough sell. But what are the alternatives? More noise and air pollution? More accidents? More lives lost? It’s time to move forward. Without a solution, the intersection of King Edward Avenue and Rideau Street will continue to make the news far too often, and for all the wrong reasons. We look forward with anticipation to the results of the feasibility study. But if not the tunnel, then what? What do you think? Leave your comments below. We eagerly await your opinion! The idea of a truck tunnel to connect the MacDonald-Carter bridge to the 417 is long past-due. Yes, the costings for the tunnel will need to be precise with a sizable ‘fudge factor’ – nothing gets done in Ottawa without cost-overruns! BUT, the principal problem I forsee will be the connection to the 417 itself. 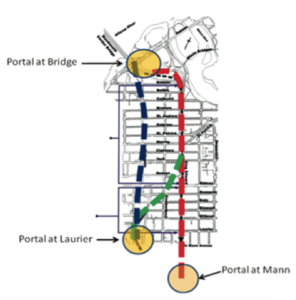 Any portal built within the confines of the Sandy Hill or uOttawa communities will be a non-starter due to noise and visual blight – not to mention the NIBY factor. Any southbound tunnel surfacing from under Sandy Hill near the uOttawa Sport arena will face a STEEP climb up – and over – to be able to bridge the 417 lanes in order to form an access ramp interchange. That will prove to be unpopular with heavy-laden trucks emerging from the tunnel. And the northbound descent will be equally steep and sharply curved in order to access the tunnel. Trucks using their dynamic brakes are not a welcome sound in any community. So a tunnel will need to run from behind External Affairs, under King Edward, deep under Sandy Hill, then emerge in the vacinity of the Ncholas interchange with the 417. There is a suitable bare-patch to the west of Nicholas for a tunnel to surface, but the east-west connection ramps will be steeply graded, and sharp corners, thus will put a strain on the existing interchange. So a direct connection to the 417 might not be workable. However, my suggestion would be to suface the tunnel route PARALLEL to Nicholas in the bare land patch on the west side of Nicholas, then bridge both the 417, and Mann Avenues, (without ramps) and traverse the old military compund / park on Mann, a bridge cross the Rideau, and build a Y junction in the scrap ground beside Hurdman transit station in order to connect with Riverside. ** Westbound traffic COULD have a drop off down to the tunnel parallel to the existing Mann Ave drop-off, but that’s something for the designers to figure out. Build the east end bridge and the make that the truck route. Much less expensive solution .